Danish churches are full of frescoes. 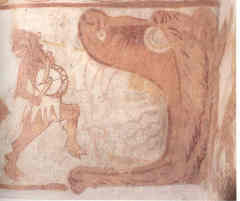 Many of those frescoes show Judgement Day where one can see devils dragging sinners into Hell and this motive has much in common with the dance of death. First of all there's a procession with music and dance. 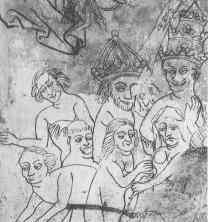 See for instance the picture to the left from the church of Gundslev where a drumming devil leads a score of lost souls into the maws of Hell (the painting is badly preserved so the lost souls are really lost). Secondly, the sinners clearly belong to all the different classes of society. 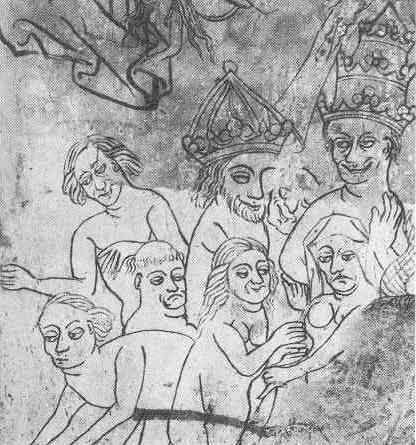 See for instance the rogues' gallery to the right from the church of Jetsmark: Even though they are naked, you can tell the pope by his triple crown, the king by his crown, the monk by his tonsure and the wife by her head scarf. Dances of death as such are a bit more rare so what follows here is a complete list of dances of death in Danish churches. The number of Danish dances of death depends on how you define dances of death and how you define Denmark. Dances of death in areas that used to be Danish: Malmø in Scania and Ronneby in Blekinge. Kalkmalerier i danske kirker. Picture database with frescoes from all (!) Danish churches. www.angelfire.com/de/idril/death.html. Another Danish site about the concept of Death in the Middle Ages. Dødedansfrisen i Nørre Alslev kirke A Danish site about the fresco in Nørre Alslev church. The vicar is webmaster. The dance of death in Tallinn -- Tallinn means "the Danish city". Click the hand in the bottom, right corner to get to the next page.